One thing you'll notice about Scorchy Slots is that it's unlike the other slot machine games on Neopets, like the Black Pawkeet Slots. You play this game in your browser, whereas the others are played as Flash Games. That means you can get Random Events while playing Scorchy Slots! Gameplay is very easy. Just click "Play Again" to play another round! Each game costs 5 NP to play. 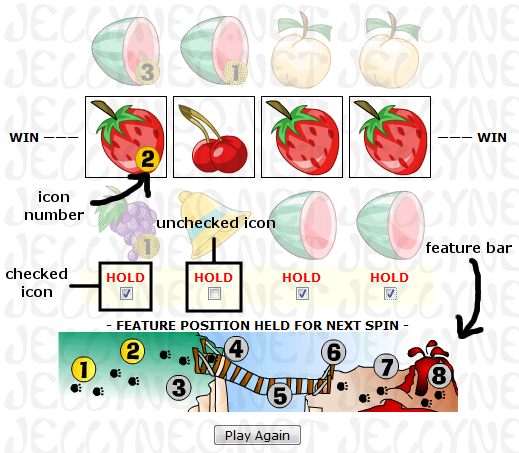 Like in any slots game, you can win Neopoints depending on which icons appear in your win column. When you get three or four of a kind, you win a certain amount of Neopoints; you'll notice that when you do win something, the "Play Again" button changes to a "Collect Winnings" button. Clicking the "Collect Winnings" button will add the Neopoints you won that round to the amount you have on hand and start a new round of Scorchy Slots. If you are very lucky, you can even earn a trophy for this game! Your score is based on the amount of Neopoints you win when you hit the jackpot. Here's a list of all the prizes you can win playing Scorchy Slots. You only win when you get three or four icons in a row. Scorchy Slots has a bit of a twist to it; sometimes, the game will let you hold your icons for a couple of rounds or until you win something. A small check box will appear under each of the four icons and from there you can choose which icons you would like to hold until the next round! When you hit "Play Again," you'll notice that the icons you checked off do not move from their positions. There are also small, round yellow circles with numbers in the bottom right-hand corner on some of the icons. These numbers contribute to your "feature bar," the small image beneath your icons. For example, if you have an apple with the number 2 and a peach with the number 3, 5 numbers on the feature bar will be lit up. These prizes can be won when your feature bar is completely full! You either win Neopoints or lose Neopoints, depending on which message you receive. What? There's actually strategy to this game? Yes, believe it or not, there is a strategy to playing Scorchy Slots! Even though most of the time you'll end up hitting the "Play Again" button, sometimes there's just a little bit more you have to think about. First off, open a new window or tab with the list of prizes. This will help you determine which icons to hold and increase the payout you get. 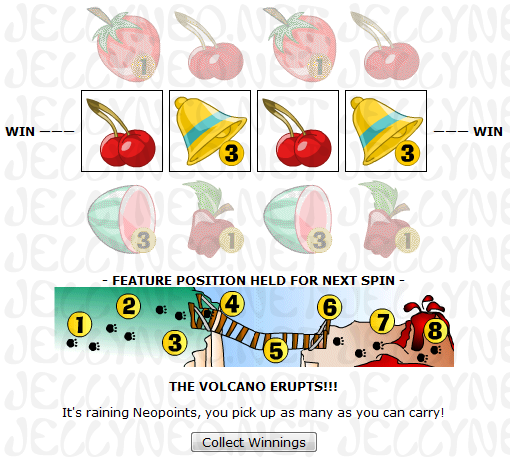 The most obvious strategy for winning Neopoints is by using the hold option and the feature bar, trying to light up all the steps to the volcano. All you have to do is hold the icons with the highest numbers (if you are given the option to hold them), and your chances of making the volcano erupt are increased. However, sometimes you will be given the option to hold icons, and there are no numbers on them! You might be wondering, "what do I do?" A good way of determining which icons to hold is by looking for two of a kind, where there are two of the same icon sitting side-by-side. This increases the chance of getting a three of a kind on your next spin. In this case, hold the pair in the middle regardless of payout; by holding the two grapes rather than the cherries on the left and right sides, you have a much greater chance of ending up with grapes on either side of the two you've decided to hold. Holding the two cherries means that you would need to achieve two cherries in the middle to be able to win. Statistically, getting four of a kind is much more difficult than just a three of a kind! The next strategy deals with getting a row full of different icons in which you have no way of filling the feature bar or looking for pairs - so which do you choose? My advice is to look at the ends of your row and ignore the middle. Choose the icon with the highest value, with the exceptions being faeries, money bags, and map pieces. These icons don't show up very often in comparison with, say, an apple or a cherry; from my experience, it's hard to get even three of a kind with these three icons! I rarely win faeries or map pieces this way, but you can try if you feel lucky! By picking an icon on the end or beginning of the row with the highest value, you still have a chance to win at least a three of a kind with different icons or the same icons. If you pick one from the center of the row, you would need two of the same icon to be able to win. I have a higher value AND a better chance at winning! Eventually, your pets will become bored with the game, requiring you to wait till the next day to continue playing, very similar to Dice-a-Roo. In any case, Scorchy Slots is a nice game that pretty much everyone can understand. Although it's purely luck and chance, there's a reason why it's been around for so long!